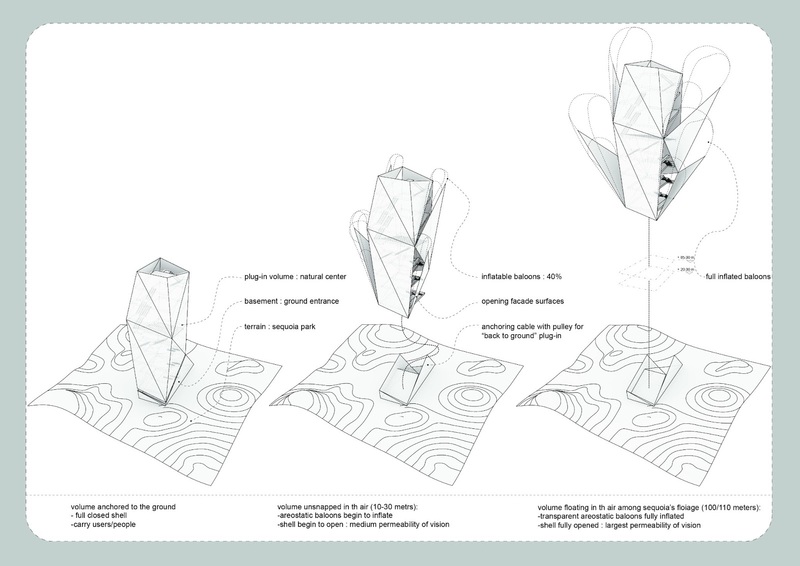 Flying Foliage is a project ,developed with a friend of mine (Marco Carrara), for INNATURE2 idea-competition. 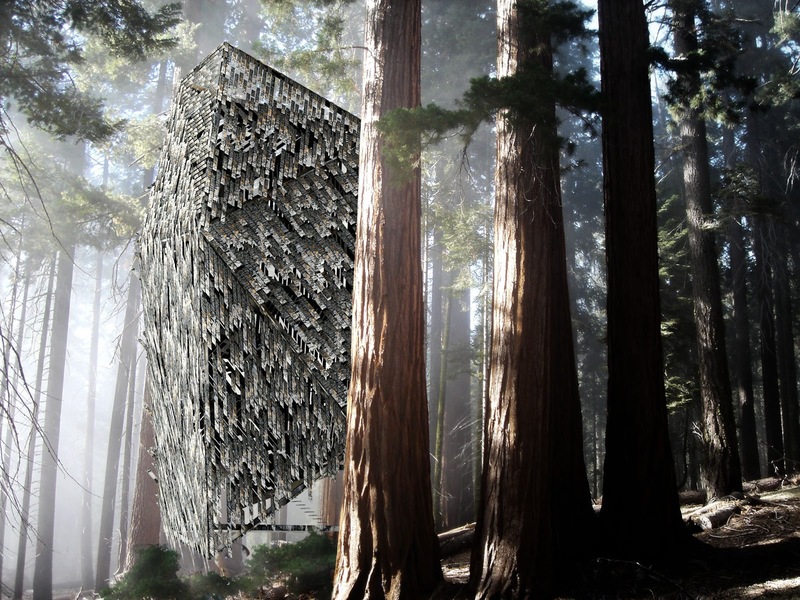 We had to propose a cutting-edge concept for a new model of natural center.The project is about a natural center situated in California (US) in the sequoia park.In this park the users find the oldest living being on earth. Enormous trees and amazing landscapes. 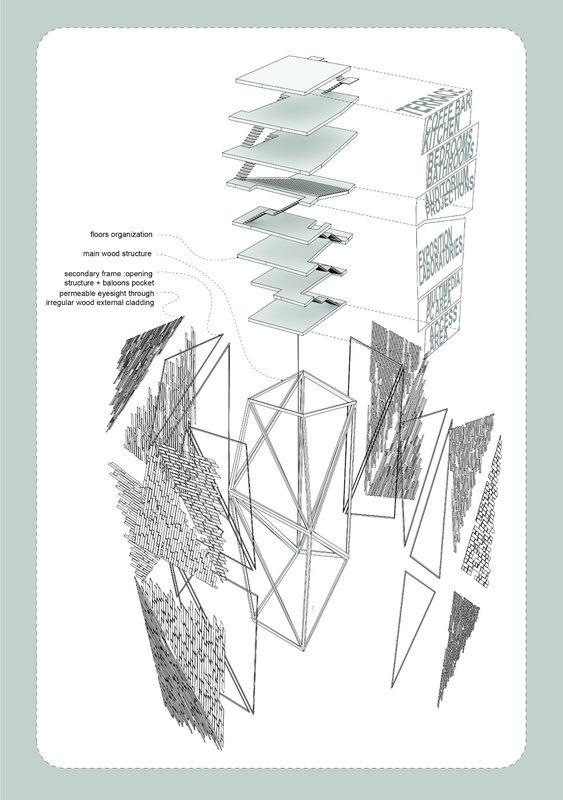 The aim of the project is build a relationship with existing trees and give the users a new way of looking at nature.The lightweight-building is mobile. With the help of inflatables baloons, it can slowly fly and reach the top of the trees. In this way users can observe this macro-ecology form a non-human scale and point of view.While doing this the building doesn’t damage the existing sequoias (not anchoring to them). This continuous movement do not produce noise (as machines or planes do) preserving the silent and the atmosphere that the user find in these places. Anchored to the ground with a cable, the building can get back to the terrain after floating in the air. This produce an interesting contradiction: on one side you find heavy and big trees that transfer their weight to the ground, on the other side the building that float in the air,cable-anchored in tension like pure lightness. The concept has been developed in 3 days only out of work-time, working during lunchtime and after dinner till the force has been with us (as Yoda would probably say).Given the suuuper-short time, i have to say i'm quite happy of the result.